Allan, originally uploaded by The Bacher Family. Allan Dreyer is one of our very dedicated Meadow Rover volunteers at Paradise. 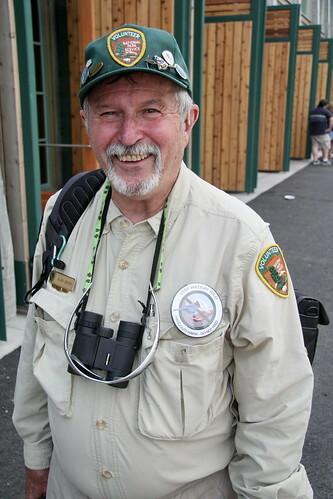 He's been working with us for several years now, and in addition to patroling trails, has been a major asset in the visitor center, talking to visitors about what it's like to climb the Mountain, and painting gorgous pictures of the scenery visible through the windows. This photo captures his always-positive personality perfectly.